Binghamton (United States) (AFP) – What do a New York lawyer, a business owner who calls himself a left-leaning Republican and a construction worker who elected Barack Obama have in common? They’re voting for Donald Trump. None of them live on the breadline. They share surprisingly varied opinions. Yet they are profoundly frustrated — with the economy, with career politicians and with perceptions of declining American prestige. The Republican frontrunner’s supporters are often portrayed as undereducated, underearning whites. But in upstate New York, where Trump calls himself “the most popular person that’s ever lived,” the breadth of support spotlights his enduring appeal, albeit as the Republican elites plot to bring him down. The most divisive presidential campaign in a generation hits New York on Tuesday. “I don’t think he’s the Hitler everyone puts him out to be, I really truly don’t and as a New Yorker I grew up with the guy,” says Lloyd Knecht, 59, who owns a heating and air conditioning company that employs 30 people. Knecht works in Binghamton, one of the fastest-shrinking towns in America and a pale imitation of an illustrious past where IBM was founded more than a century ago and where the flight simulator was invented. The gradual departure of IBM and other manufacturing corporations, taking jobs and technology overseas, has left behind unemployment above the US average and a poverty rate higher than the state average. Knecht worries about rising insurance and wage bills, though he believes in “some sort of national health plan.” He fears the economy is becoming sluggish. He supported Obama’s decriminalization of petty drug crimes. Trump’s populist message promising to bring back jobs and restore national pride with his say-it-how-it-is manner strike a deep chord in an area that has long felt forgotten by state and federal politicians. Bernie Sanders, trailing Hillary Clinton for the Democratic presidential ticket, was this week the first candidate to visit Binghamton since George W. Bush 16 years ago. Ahead of next week’s crucial primary Trump leads the Republican polls in New York state on 53.4 percent to Ohio Governor John Kasich’s 21.7 percent and Texas Senator Ted Cruz’s 17.6 percent, according to a RealClearPolitics average. Christopher Love, a union member who has lived in the area 42 years and works in construction, says Binghamton has gone from “valley of opportunity” to a “ghost town” where young people either leave or get hooked on heroin. Trump, a billionaire real-estate mogul and reality television star, is the only candidate talking about issues that matter to him, says Love. “We’ve got to do something different. What we’ve been doing the last 30 years isn’t working,” he told AFP, wearing a Trump 2016 trucker hat. His octogenarian father-in-law, who described Democrat John F. Kennedy as the best US president in his lifetime, is also supporting Trump. Binghamton supporters are not blind to Trump’s shortcomings — his tabloid divorces, business flops, dubious policy pronouncements, talk of banning Muslims. But it just makes him more human, they argue. He may be imperfect, but he’s the best of the bunch, they say. They write off Kasich and have no time for Clinton, a two-time New York senator, even if one couple admitted to voting for her in the past. “I think it’s just the frustration of people who have voted for many years and they’re getting disgusted, tired, desensitized even,” said Love, 49, asked about Trump’s appeal. Conrad Taylor, a 19-year-old student and elected Democrat on the Binghamton city council, says it is rural areas where Trump, 69, is making hay. “Would I ever vote for Trump in a million years? No, but I can easily identify why so many people in our area think that he’s a good candidate,” he said. People are angry with Republican grandees conspiring to deny Trump, who has never held elected office, the nomination — exposing a gulf between Washington’s elites and party rank-and-file. “Frankly, I’m fed up,” said Kevin Guyette, a lifelong Republican who specializes in personal injury and criminal defense law — and another backing Trump for the White House. He is exasperated by Republicans who deny climate change, marginalize women, explain the world through the Bible and refuse to entertain Obama’s pick for the Supreme Court. “They make some outlandish comments that defy logic,” he said, appearing to ignore remarks by Trump that have seen him accused of everything from misogyny to inciting violence at his rallies. But upstate New York is by no means monolithic. 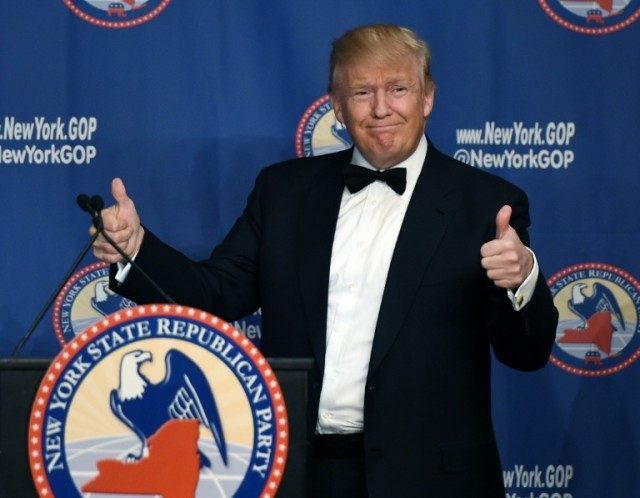 Trump has a favorability rating of 57 percent and an unfavorable rating of 39 percent among upstate Republicans, says Don Levy, director of the Siena College Research Institute, underlining how he sharply splits opinion. Even in death, it seems, that remains. Barbara Fuller, a retired music teacher and Democrat, says her late father supported Trump. But when she mentioned that at his funeral, there was disgust. “They were all like, ‘You’re kidding. No, no, no,’” she said.